Help your students improve their reading skills with French Readers from Glencoe! Learn the history of France from the Gauls up to present-day France in Section 2: Les grandes figures de l’histoire. Read four short stories by famous French authors which provide an introduction to the rich literary tradition of France in Section 3: Histoires célèbres. 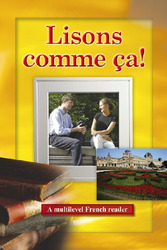 A revision of the former Easy French Reader, it can be used from the first few weeks of French studies to the third year and beyond.